Born in London in 1927, Richard Slater's exceptional talents were recognised early when he won a place at Hornsey School of Art in 1943. He has exhibited all his life: in the 1950s, he exhibited with the World Touring Exhibition of the Arts Council, and at the Royal Academy. After a distinguished career teaching art, Richard moved to Plymouth and in 1980, he devoted himself full-time to his painting. Richard Slater is both a figurative and landscape painter whose strengths derive from the particularly British tradition of a romantic engagement with the landscape. His style is related in part to a broader outlook, with its roots in his early training in illustration and lithography, but possessing what one critic has described as "visionary qualities". The rhythmic qualities of his work create an almost dream-like quality, inviting the viewer to engage with the scenes depicted, whether harbours or fields, or, in his more figurative work, figures caught in encounters that invite our curiosity. Richard Slater is one of the few artist members of The Royal Institute of Painters in Watercolour (RI) living in Devon and Cornwall. His election was the first to an artist living in Cornwall for more than 20 years. He has regularly had work accepted at the Mall Galleries in London, and in 1999, Richard was elected to the Royal Society of Painters in Watercolour. He has received many awards and prizes since 1980 and his work has been commissioned by several companies in this country and in America. 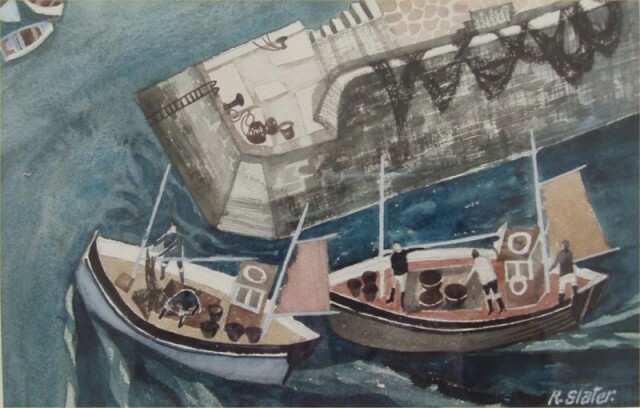 He has also exhibited with the Royal Society of Marine Artists and the Arts Council of Great Britain. The Wykeham Gallery is delighted to be exhibiting Richard Slater's work for the first time.